Learning to use the inspector effectively is one of keys to unlocking OmniFocus' power and flexibility. The inspector allows you to edit details of your OmniFocus projects, groups and actions. 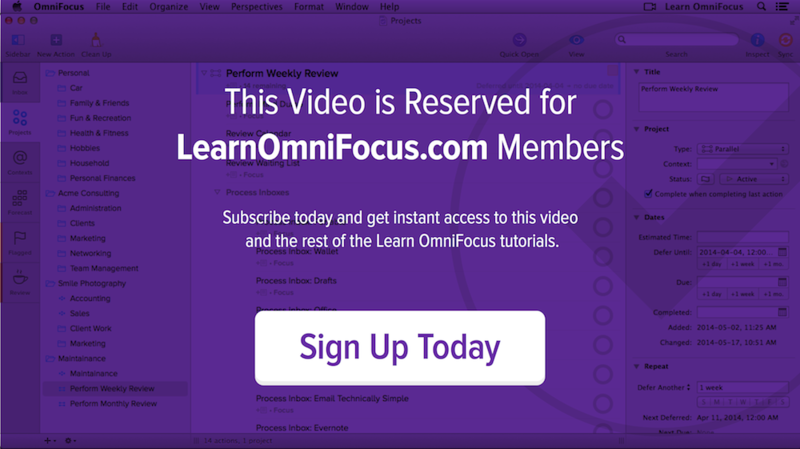 It’s key to tapping into the power and flexibility that OmniFocus offers. In this in-depth video you’ll learn how to make optimal use of the inspector. You’ll also learn how to customize the inspector based on the features that you use most frequently. While we’ll focus on the iPad, most of what you learn will apply to the iPhone as well. About the multitude of settings that are available for projects, actions and groups. How to customize the inspector based on the settings that you use most frequently. How to convert an action to a project. How to convert a project to an action or action group. How to create a project based on an action group. How to use batch editing for speed, efficiency and accuracy.